LASIT has recently realized a robotic system for marking engine blocks providing a 6-axis ABB anthropomorphic robot as the core of the operating cycle integrated in the cabinet. Marking and engraving are among the most employed laser applications in the industrial domain. As far as laser technology is concerned, since 1990 LASIT has been one of the most influential company, with over 2000 customers around the world and hundreds of models developed from simple laser engravers for small quantities to fully automatic complex systems made for customer needs. One of these advanced models is, as a matter of fact, the robotic laser marking system for engine blocks, that the Italian company has recently designed in partnership with ABB Robotica, society that has furnished the 6-axis ABB anthropomorphic robot integrated in the cabinet. 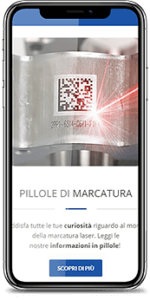 “Our machine could realize every graphic combination including bar codes and/or 2D codes such as Data Matrix or QR Codes” explains Giò Ievoli from LASIT. “Through our experience we considered that it was much more convenient marking Data Matrix in term of execution speed and traceability. In fact, the advantages are an improved readability even in case of partial damage in the matrix and/or low contrast, but also the fact that a Data Matrix can contain much more information”. The core of the machine is the cabinet, realized in welded steel, which supports the 6-axis ABB anthropomorphic robot. On this robotic arm the laser scanning head, the camera and the distance measuring sensor are installed, in addition with the exhaust system. The triple supply shuttle (right-left-center) carries the parts inside the marking cabinet thank to an axis system activated by servomotors with racks. Each platform of the shuttle is covered with polyzene and there is no need of precise positioning because the parts are scanned and recognized by the vision system. An alarm will be generated in case of incongruity. The vision system is based on a camera in the center of the marking cabinet in order to focus on all the working area. It has to verify the congruity between the set code and the part on the charging plan while centering and finding the angulation referring to the predefined model. The control system needs these information in order to orientate the laser installed on the robotic arm. The vision system for scanning the marking area is composed by a camera integrated on the marking head which defines a rectangle on the part (and/or other points) where the marking will be effectuated. Another Cognex camera reads and verifies the DataMatrix codes, while a laser telemeter measures the distance and the orientation of the marking plan in order to guarantee a perfect focusing. The turn-key system comes with 3 pre-drilled finishing tables and an exhaust system. On each table a part of the shuttle is charged with the piece and it is transported inside the marking cabinet. When marking is over, the shuttle comes back to the table and the operator can unload the part and load the next one. 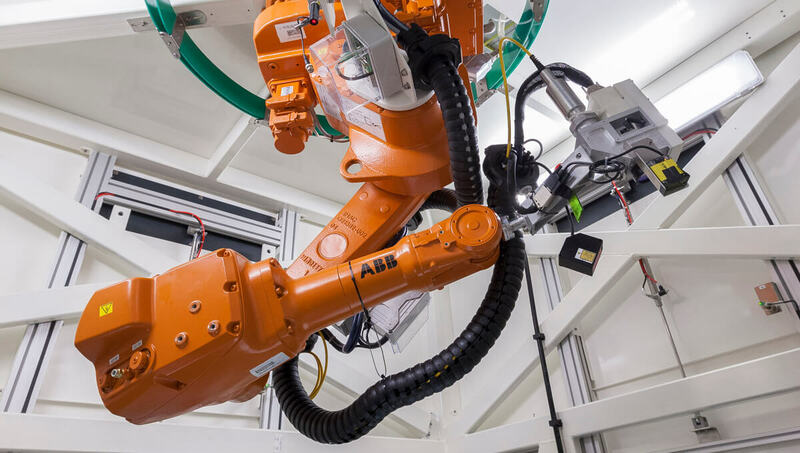 The core of the system is the ABB robot able to lift up to 20kg which is installed “upside-down” on the ceiling of the marking cabinet and which can reach every position on the 5 sides of the part thank to its 6 axes. This characteristic guarantees a great flexibility permitting to mark both pre-existent codes and new designed codes. The shuttle consists of a moving platform which is flush with the deburring plan creating a continuum surface on which the operator can comfortably work. The platform has two fixed borders made of polyzene (left and inner side) and two moving borders (frontal and right side) (optional) which are pulled out by a pneumatic cylinder just before the shuttle movement so that it prevents the risk of falling of the part. The shuttle moves on Star Rexroth ball-bearings guides, protected from dust and installed “upside-down” below the profile in order to further prevent contamination due to sand. It is activated by a servomotor with a grinded rack. Once the shuttle system carries the part inside the marking cabinet a camera installed above it focuses the part while the software verifies the congruity between the programmed code and the one already present. This operation takes few milliseconds. Once objectified the code, the coordinates of the center of the part and its angle are used for correcting the axis positioning parameters and thus the marking process. If the part has been placed in a wrong way – for example being it not aligned through the pins above a limit angle which could compromise the marking process or if it is just placed overturned or rotated 180 degrees – the system will generate an acoustic signal while the part will be brought out in order to be correctly placed by the operator. If the machine is connected to a SMTP server it can automatically send an email to assigned addresses for signaling the anomaly.